How Do Mold and Rot Damage Homes? | Mold Causing Structural Damage in Crawl Space and Basement. How Do Mold and Rot Damage Homes? 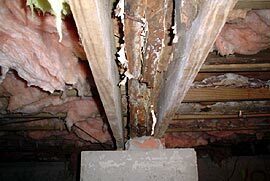 The same conditions that promote the growth of mold invite decay fungi to rot wood. The presence of mold and dispersion of mold spores will reduce the indoor air quality of your home. Mold will also cause unsightly stains and unpleasant odors. It will not, however, cause structural damage. Mold tends to grow on surfaces rather than deep into substrates. In order for structural damage to occur decay fungi, mold's cousin, need to gain a foothold. Don't be complacent though. The presence of mold means that the conditions are probably right for the fungi that cause decay, too. Decay fungi spores, moisture, food, and temperatures over 40 degrees are all it takes for the rot process to begin. 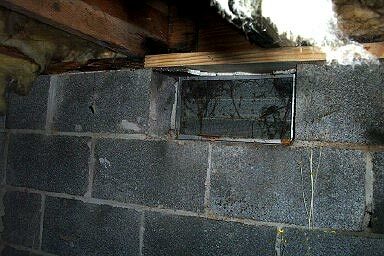 Rot can occur anywhere in the home, but the crawlspace is the most common locations. Floor joists, girders, and sill plates - basically the entire floor framing system under your house – are vulnerable to rot – and making repairs isn't cheap. Imagine a carpenter trying to figure out how he's going to crawl under your home and get new 16-foot-long 2" x 10"s in place, with all the duct work, wiring, plumbing, and bridging (cross bracing) that are attached to the old rotted joists. In a low crawlspace, take into consideration he will be operating on his back. It's not easy on him, and it's not going to be easy on your bank account. When the floors in this New England condominium began bouncing and getting soft, new framing lumber was installed to either side of every girder and every floor joist so the home would not cave in. Once the crawlspace was encapsulated and dehumidified using Basement Systems CleanSpace® Crawl Space Encapsulation system, the moisture problem was eliminated. That the sill plate had to be replaced over this vent was no coincidence. Vents are a prime source of moisture-laden air – just what decay fungi prefers. Your vents should always be some of the first things your contractor inspects. Most of the time, structural repairs are done without fixing the problem. So it's only a matter of time before the new framing rots out, and has to be torn out and replaced again. 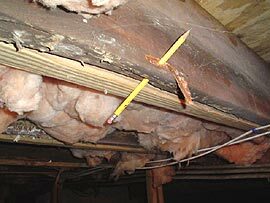 If you want your house to last, it's imperative to eliminate the moist conditions that lead to rot in the first place. Find a mold removal expert in your area who can repair all of your mold issues and prevent mold from damaging your home and health. Many Basement Systems, Inc. dealers offer Free Estimates! Contact us today to learn more.